The above pic is a speedpaint of songstress, Amy Winehouse. It turned out almost zombie-like so I guess that means it's a good likeness. Below is a cropped part of a piece done for the blog 'The Attractive Art Collective'. It's a group blog I'm part of with some great artists contributing art of the female variety. For this piece I was inspired by the Frazetta female form. I used felt tip pens with additional drawing in Photoshop. realy realy good... I ve got to learn about that again.. So, I put it on my deskstop..! I think you caught the cancer that is the crack that Amy's on takin over her flesh! lol Truely amazing man! You are a beast! You definitely got the likeness. It's sad how much she's changed. I did an illustration of her for Philadelphia Weekly a few years ago and she's unrecognizable now. Is the B&W line art Dejah Thoris? Wow! You defintely captured her! Great speed paint! That's a tragic, but masterful Amy! Man Mr. Wahl your are really awesome with the paintings. I think it looks just like her. Been waiting for your posts for ages, Chris! :) And this is just awesome! That's a speedpaint?!! Wow! And I always love how you draw the women!!! Please post more hehe! :D Cheers, Mr.Wahl! Mr. Sable- It's no one in particular, just a generic sword and sorcery chick. Mr. Wahl. What else can i say? Love the Frazetta style--he always drew such naturally human female shapes. Your homage is very nice. Nice Winehouse, but I never ever get tired of looking at your inkwork. It makes me realize how much I still have to learn. Good to hear from you all. Thanks! Awesome work . . . love that Winehouse! Top work on Amy Chris! Man, that "Amy" is Skank-a-licious! Amazing work, I'm blown away! i stumbled onto your blog looking for different digital painting techniques...I am now utterly amazed at your work. I will most definitely visit from time to time. That Amy is so good, Chris! Unique take on that troubled, self destructive individual. Great stuff! That Amy Winehouse pic scares the hell out of me. Amazing. Wow! Amy Winehouse looks rank. Then I succeeded. Thanks, Amy! 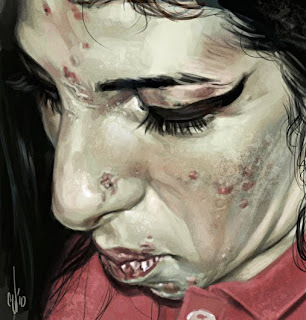 the Amy painting is one of the poignant images I have seen in a long time - tragic.